Making spherical surfaces where the surface is less than a hemisphere is covered under the use of a rotary table. Some of the techniques used there could be used using the dividing head. But, in general, they were useful for making large surfaces. It is possible to use a dividing head to make surfaces that are larger than a hemisphere though the size that can be made might be smaller. Such surfaces are usually known as balls though, strictly, they are not. They are usually cut so they remain on some sort of shaft. They are best cut using a boring head as a fly cutter with a small diameter. Usually, when using a boring head, the cut is made from the inside of a hole and the cutter is moving outwards. In this case the cutter is fixed but is rotating on the outside of the workpiece. So the cutter has to be turned round. This means it is pointing the “wrong” way. It will only cut by putting the motor in reverse. Balls made like this are not part of a perfect sphere. But they are still good enough for making knobs etc. Balls made this way are not accurate and are only suitable for purposes such as handles. 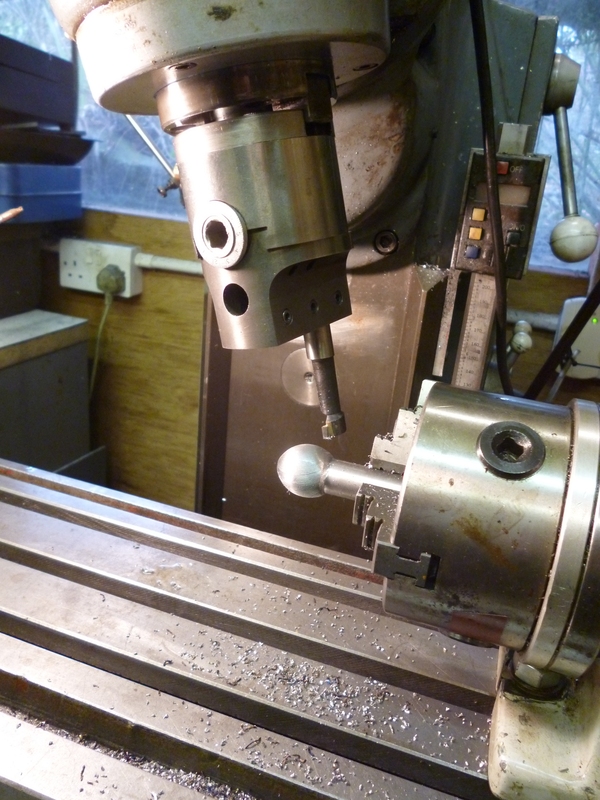 This does mean that the cutting diameter of the boring head can be taken to be the same as the “diameter” of the ball. The angle of tilt of the head, α, is such that sin α = radius of shaft/diameter of ball. It is essential that the axes of the dividing head and that of the spindle are in the same x/z plane.